Get Spartan lucky out here in the desert. Welcome to Laughlin Nevada, a jewel in the middle of the desert nestled against the Colorado River on the Nevada/Arizona border. 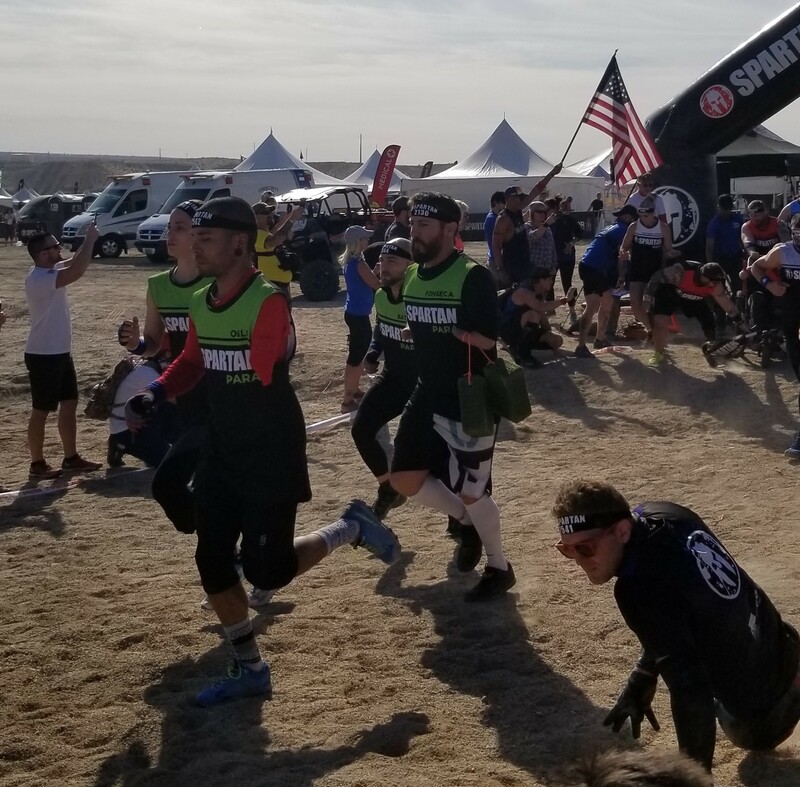 What started as a small hotel and bar for miners in the 1940's has grown to be a grand resort community and now home to its first Spartan Race event. Recently Spartan made history, as Laughlin, Nevada was home to Spartans first adaptive athlete only event and the Spartan Kids World Championship. Looking across the desert into Arizona. 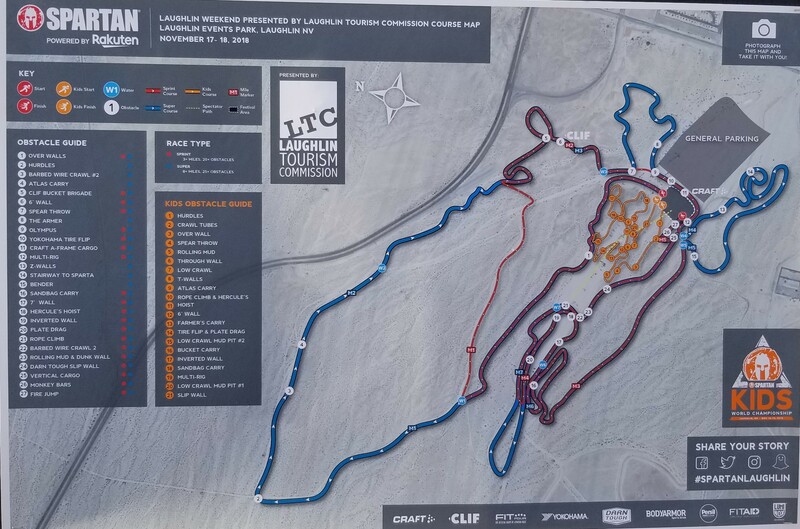 Out of the nine Spartan Races that I have had the opportunity to participate in this year, this one by far had the easiest venue to navigate. Parking was excellent right out in front of the registration tents; the festival area was set up in such a way that you could find everything fairly quickly, nothing was hidden or off of the beaten path, even the town of Laughlin was a stones throw away from the event so everything was streamlined and the flow was the best I have seen it. According to the master of ceremonies and a few others, the mileage was about 4.5, the course map shows just over 5 and my Garmin said 5.46 by the end of the race so somewhere between 4.5 and 5.5 miles was the distance for this one. The flow was interesting, with long distances followed by 4 or 5 obstacles, this made for some upper body testing due to little rest periods in between obstacles. There wasn't anything new in the way of obstacles but the terrain was the real test to your endurance, soft, sand like pebbles made it feel like you were trying to run on a beach the whole time trying to maintain balance up and down over small hills throughout the course. The weather was a mild 78-82 and dry, there was only one muddy portion to this course (rolling mud) so you really didn’t get all that dirty unless you were doing burpees the whole time. Overall the course itself was pretty basic but good for first time Spartans to come and get their feet wet. Beginning of the Spartan Para Athlete heat. I was super stoked that I could be on the course during this event, as watching these tremendous athletes navigate the same course as I did gave me and my wife, who was running her first event ever, the encouragement to push harder and give every effort. These guys and gals are a great example of perseverance, tenacity and grit. They are role models for us and our children that remind us we should remove any sense of the word “quit” that may be lingering in the mind. Kacey McCallister and Team Some Assembly Required running out of the gate. I am a big supporter of Oscar Mike and I am glad that they were so heavily involved with making this happen. 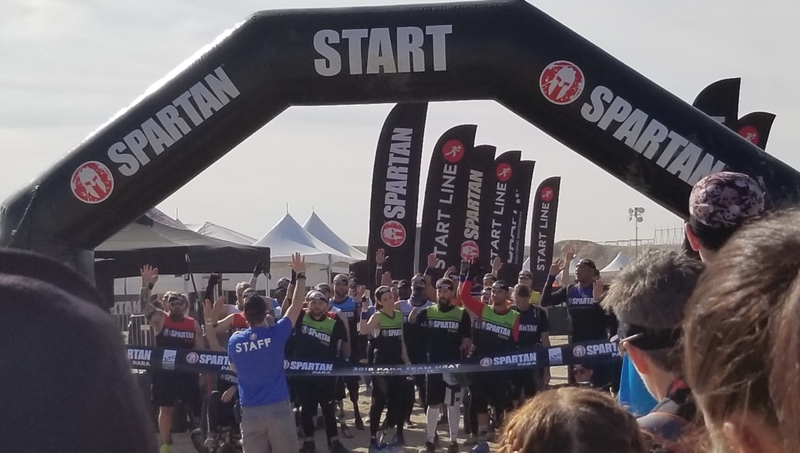 An event like this was needed, not just in Spartan, but in the OCR community a as a whole and I am glad that the powers that be came together and created a fantastic event launch and that I was able to witness it. 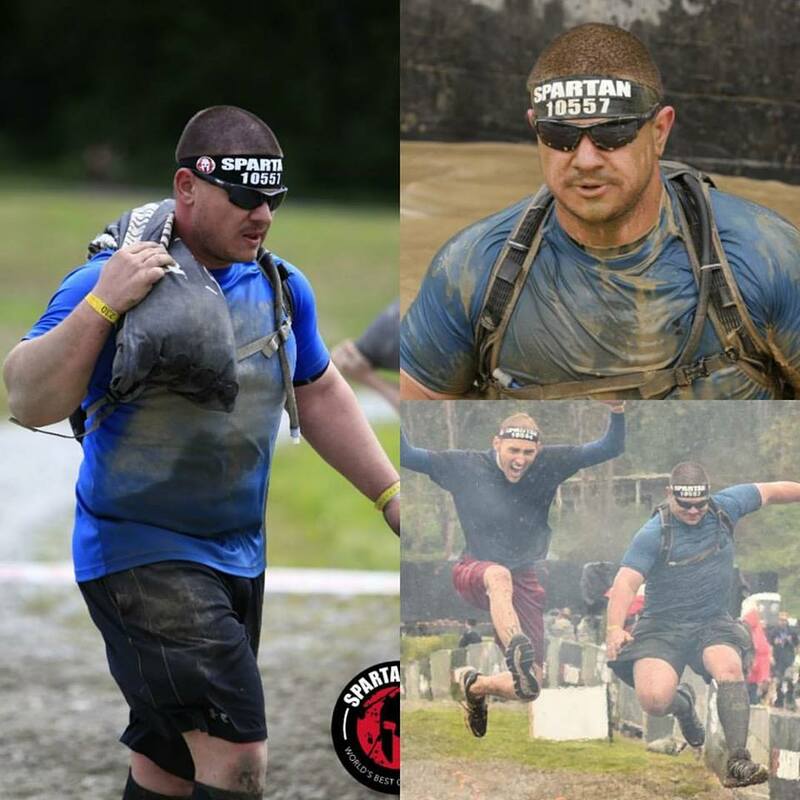 I look forward to future events like this one at other Spartan locations. I encourage you, if you haven’t taken a look at Sean Settle’s video coverage here on Mudrunguide.com of these guys taking on the course, then be sure to do so, they will take away any of your reasons for saying “I can’t”. I was pretty happy with the overall setup of the .5 mile and the 1 mile courses for the kids. I had two of mine in the .5 mile and one in the 1 mile and all three of them loved the event. I ran with them both times to be able to get photo/video and there really wasn’t anywhere that I couldn’t get a good view of them navigating the obstacles. There was also a bounce house and a snow-cone vendor so the waiting for their start times passed relatively quickly as they weren’t bored waiting to go. The .5 mile course was pretty tame as far obstacles were concerned. They had the A-frame, spear throw, low crawl, walls and rolling mud. 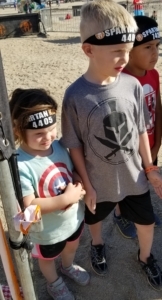 There was a lot of sprinting involved but this .5 mile course was perfect for the younger groups like my 4 and 6 year old. Flying through the Ring Rig. 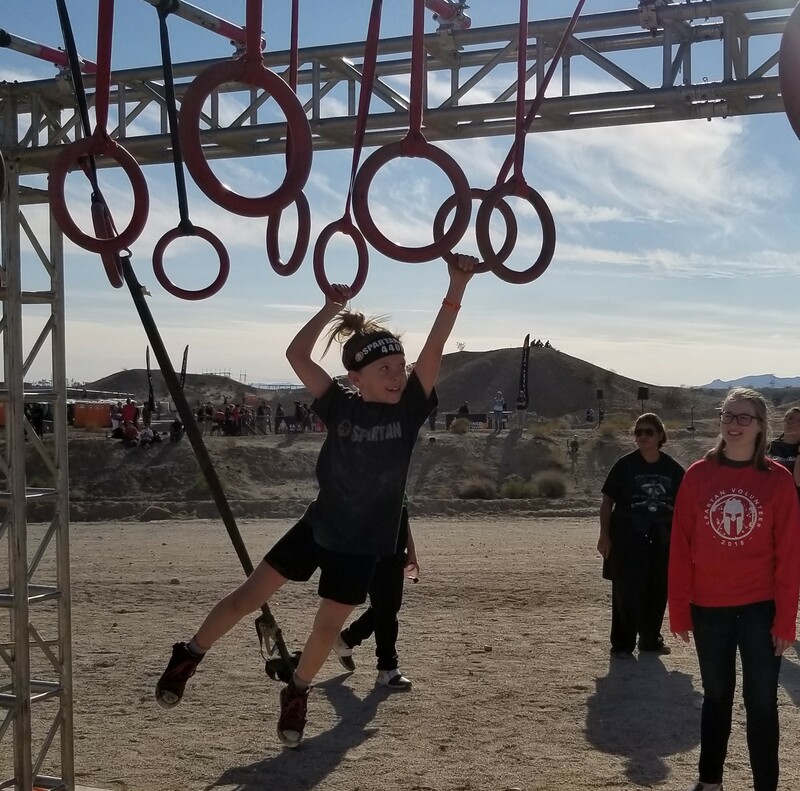 The 1 mile course had all of the obstacles of the .5 mile, with the added ring rig, tunnel crawl, sand bag carry with 5 burpees, Z-Wall, slip wall, inverted wall and longer sprints. This course gave just enough added difficulty that this age group can get prepared for the next level of difficulty but in a tapered way. 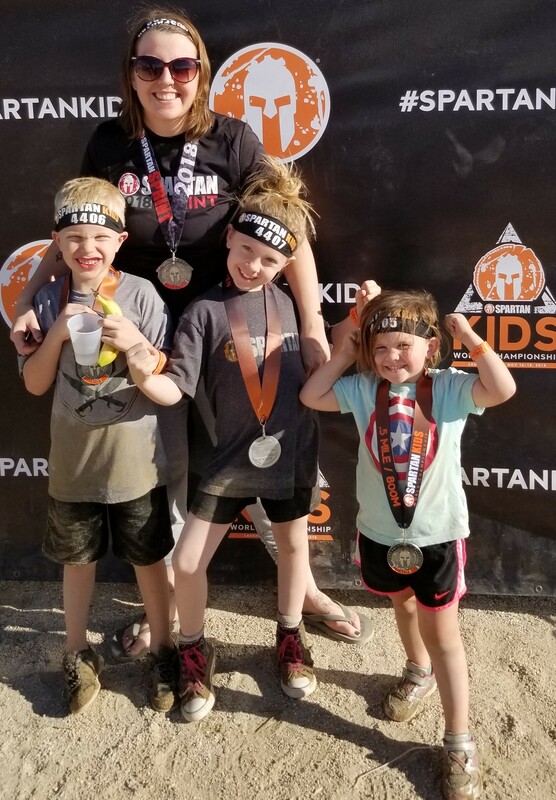 I love that my kids are able to participate in something that I love to do, so that it becomes a family event and lifestyle rather than something that takes me away from them. They are super happy about their medals. 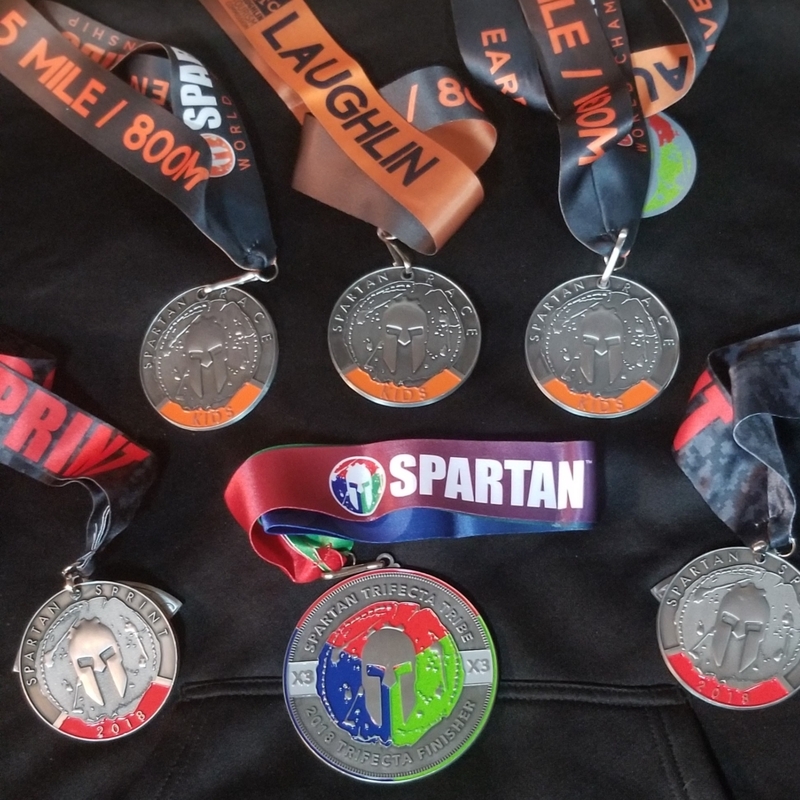 So, besides my normal complaint about horrible finisher shirts, I have noticed a steady trend down in either the quality /quantity of volunteers at Spartan events. This time around it was both in quantity and quality. I noticed that there seemed to be a shortage of volunteers for water stations and for the kid’s races. It is also worth noting that if you are a volunteer, you represent the brand and the sport, and you should act appropriately, not leaning up against an obstacle heckling racers or taking a nap. We all want to continue to enjoy and grow our sport and we all have to play a part in keeping it positive, even when our part seems monotonous, it is important. This event was by far the best for a family oriented trip. There are plenty of local things for families to do together like visiting Hoover Dam, The Grand Canyon, The Mojave Desert, The Colorado River or Lake Meade. There were plenty of accommodations with all of the casino hotels right in Laughlin that were very much walking distance from the venue. This made the Laughlin Sprint a perfect destination for a race-cation and our final destination to accomplish our goals for 2018.